The past few weeks it has been very quiet on my trailcam. And then all of a sudden: Bam! The elephants are back, they are breaking and entering the garden again and I have had to say goodbye to my vegetables. When I walked out of the house early on Wednesday morning to take my trailcam of the fence, the sun had not even come over the hills behind the bridge. The first thing I noticed was that my lovely kudu lilies were not looking the way they looked the day before. Then I saw some debris from the Haak en Steek on the path and I just knew… The elephants had been in the yard. I quickly walked over to my vegetable garden and little nursery. My heart just sank about as deep as my jaw dropped: Total devastation. Time for some a bit of ‘Crime Scene Investigation’. As I suspected, the elephants had broken through the side gate again. And as I wrote in last weeks blog: Dear Elephants of Malelane Section – We need to Talk, there was considerable damage to my trees, flowers and succulents. I am still heartsore about my Barberton Daisies… Anyway, I was not going to be home for most of the day, so I closed the side gate again the best I could and got the boys ready for school. 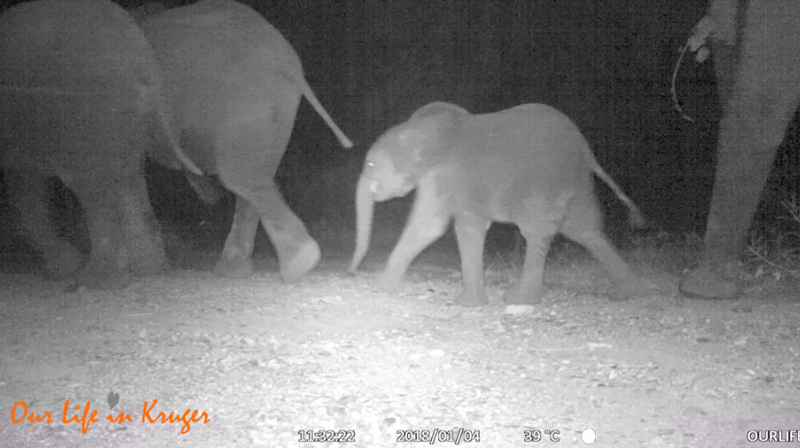 Funny enough, the trailcam picked up a lot of elephant activity that night. And I am pretty sure that the breeding herd that you see rushing past to the left, is the same elephants that did so much damage that I am wondering if I should just call my attempts to make a garden quits for now. Just after they walk past, I think you can actually hear them break part of the fence next door. It is sure sounds like it. What do you think? The next day, I walked into our living room after a hectic night with a sick Alex. In the first morning light, I saw water glistening next to our tap. I was sure I did not leave the tap open after watering the grass our gardener planted, so I was a bit puzzled. But sure enough, the side gate was now lying in a heap of mangled pipes and wire and the already damaged Acacia tree had now even less bark on it. So I can only come to the very strange conclusion that an elephant actually turned the tap on?? I have no other explanation for it!! Do elephants know how to open a tap? My garden is turning into an elephant restaurant where I don’t just serve food, but drinks too! So, here I am with a side gate I can no longer close, a garden full of weeds but no vegetables and I suspect a porcupine has been feasting on my desert roses. I have had my trailcam set up there for two nights in a row, but so far I have not managed to catch whoever it is that is munching away on those gorgeous little succulents. The elephants have definitely won this round. And I have to be honest, I sometimes feel like throwing in the towel. I have taken all the suggestions of the dear people that have been commenting to my elephant woes to heart. The difficulty with some of the suggestions is, that I don’t know when the elephants plan their next ‘attack’. Which makes it hard to spray chilli paste infused water or something like that on the fence. I don’t see myself doing that every night after I bath the boys and put them in bed. So for now, Steven and I are in the process of devising a plan. We shall report back with our findings after we have tried and tested a few options and your suggestions. Oh Linda, as much as you surely love seeing the elephants it must be so disheartening 😯. The chilli paste can be smeared on wearing rubber gloves and unless it rains for days it should not need renewing for quite some considerable time. The ellie nose is very sensitive so if it works it will work for a while – especially if you have smeared it onto the underside of the piping and so on. Just noticed that your trailcam date appears to be January 2018 (or if it is American date format then April 2018). And I pitched the idea to Steven. He said, that if the elephants really want to come in, they will just reverse in the chilly pasta smeared gate? That would be hysterical to watch. So we are waiting for our side gate to be removed and closed with normal chicken mesh and then we shall start testing elephant counter measures! Me too! First time I get a hippo on my camera! Thanks, I am going to add that to the list of elephant deterrents to try out! I would like to call upon all readers – big and small – to devote 1 week of there time to Linda and work as a security guard at her garden. As security guard you just have to ensure that any animal who wants to enter Linda’s bar and grill garden do so after paying the applicable all-in-one fee. Off course it’s only a suggestion at this stage. I like that idea …. but i’m afraid of elephants! But just love reading your stories. Will be i Berg en Dal in July and can’t wait. I will take payment in the form of lekker sightings in the park! I feel for you Linda. Best is to give up gardening. Also take your camera inside before they trample it ! The camera is too much fun to not put outside! Love all the ellies, and herd of impala passing through and the hippo!!! How awesome. I know how painful it if your hard work gardening gets ruined, at the previous place it was always the Nyala and the Springbuck. Hope you find a solution. Loved the video. The hare and the hippo were such great surprises. I’m really sorry that you are having such a struggle to maintain your garden; so disheartening. I hope you manage to get that side gate patched up and strengthened somehow. I agree – that definitely sounded like ellies forcing their way into the neighbour’s side gate! Hope you and Steven manage to come up with a solution.